On April 4 morning a police constable by the name Mr. Murugesan from Avaraikulam village beat up one Mr. Pathira Pandi from Koodankulam claiming the latter had asked the local shopkeepers to close their shops in support of our protest. Mr. Pandi suffered severe injuries on his face and chest. Since it is futile to complain to the local police about a local policeman, his family preferred not to file any complaint. They were also afraid of more police harassment including false cases. We hear that the local police at Koodankulam are filing FIRs on every shopkeeper who does not open his shop. This is quite a new record on the Indian State‘s upholding of our civil rights. The Chief Minister of Tamil Nadu had demanded all the power from the Koodankulam nuclear power plant for Tamil Nadu. Some of the Congress party leaders had also supported her claim. But the junior minister at the power ministry in Delhi has clarified that Tamil Nadu would get only 50 percent power from Koodankulam, other states would get 35 percent and the central pool would receive 15 percent. 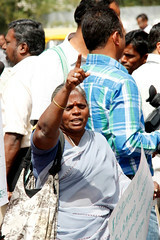 The people of Tamil Nadu expect the Chief Minister to explain her stand on the Koodankulam project now. The people of Tamil Nadu would pay a heavy price for the mega nuclear park but we will get only 50 percent power. There are plans to give electricity even to Sri Lanka from the Koodankulam project. 148 people from the coastal village of Koottapuli have been released from the prison and they were accorded a hero’s welcome by the village people when they all reached their homes on April 4th evening. Earlier large crowds of people including anti-nuclear activists and cadres of several political outfits welcomed and honored them at Tiruchi and Tirunelveli. Some 50 more people may get their bail applications approved today. But there is no official word on cancelling all the false cases that have been foisted on us. Today is the 161st day of the relay hunger strike. On the 160th day yesterday thousands of people from all the neighboring villages and even some distant towns in Tamil Nadu participated in the hunger strike.